The author is a reporter at Tibet Express based in Dharamsala, India; the views expressed in this piece are those of the author's. Translated from the original text in Tibetan language by Lobsang. Following China’s invasion of Tibet, China forced Tibetans to sign the seventeen point agreement under duress. When China violated its own forced agreement to implement destructive campaign in Tibet, Tibetan people ultimately came out on the streets of Lhasa on March 10th protesting Chinese invasion calling for Tibet’s Independence and long life of His Holiness 14th Dalai Lama. Unfortunately on the 56th Tibetan National Uprising day, instead of paying homage to the sacrifices made by our martyrs, a few individuals have tried to ban the Free Tibet slogans and alienate those calling for Tibet’s Independence in New York, USA. Who were the organizers of the March 10th Demonstrations in New York? The organizers of the March 10th demonstrations in New York were Tibetan Community New York and New Jersey (TCNYNJ), Regional Tibet Youth Congress New York and New Jersey (RTYCNYNJ), Regional Tibetan Women’s Association (RTWA) and Regional Chushi Gangdruk Association. Since the Tibetan Community New York/New Jersey (TCNYNJ) is an organization formed for the welfare of the Tibetans living in New York, devoid of any ideological affiliations, if this organization turns itself into a specific political ideology-driven organization that exhibits intolerance to difference in opinion and starts excluding people supporting Tibetan independence, then the community members need to reflect on its founding objectives. Individuals mainly responsible for ostracizing those protestors shouting slogans calling for “Free Tibet” were Sonam Gyaltsen, President of TCNYNJ, Thinley Kelsang, Vice President TCNYNJ, and Ngawang Palden, President of RTYCNYNJ. I hope that the act of ostracization was a personal initiative of these three leaders, and does not reflect the official policy of the organizations that these people were representing. The intention behind forcibly pushing aside those carrying “Free Tibet” banner was clearly to bring division in our community rather than bringing everyone together. Since the founding of the Tibetan Youth Congress the crucial goal of the organization has been to struggle for Tibet’s Independence, and with time, the organization has gained much respect from the Tibetan Government-in-Exile as well as the Tibetan People. However, few former and current executive members of RTYC New York and New Jersey, while still in their official capacity have spoken out against TYC’s political stand. It clearly shows that their intention is none other than to disrupt the organization. If they did not agree with TYC’s political stand, they were free to step down from their official position and join Tibetan People’s Movement for Middle Way which already exists. The original image of Sangay Dolma with “Tibet is an indepenpent county” written on her left hand. Tibetan Women’s Association was initially founded to rebuild the nation but in recent time it has fallen under directives of few influential individuals in exile. By doing so, TWA has proved that they lack the capacity to take a firm stand on any ideology, and work towards it. Therefore it would be difficult for any Tibetan woman advocating for Tibet’s independence to be a part of the organization. 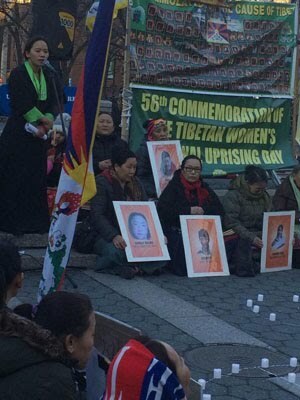 When RTWA New York commemorated March 12th Tibetan Women’s Uprising, they should have paid tribute to the sacrifices made by the Tibetan women in 1959 uprising. But shockingly enough, at the commemoration, RTWA carried an edited and altered image of Sangay Dolma, a Tibetan woman who self-immolated in Tibet against China’s occupation. 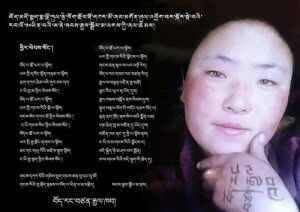 The original image of Sangay Dolma, taken before she set herself on fire and received by the Tibetan exile community after her self-immolation protest, features “Independence for Tibet” written on her hand. At the March 12th commemoration, RTWA New York displayed the cropped image of Sangay Dolma without her message of Independence. This was not a mistake as Central Tibetan Women Association in their newsletter ‘Voice’ published the cropped image of Sangay Dolma. Such an act of manipulation is nothing but a dishonor to the brave sacrifices made by Tibetan women inside Tibet. Members of RTWA displaying cropped image of Sangay Dolma without her message. Though Chushi Gangdruk was formerly a voluntary resistance army led by Andruk Gonpo Tashi to counter the Chinese military invasion, this once fierce resistance army has become a Khampa Welfare Association in exile due to various reasons. As a result, they are unable to carry the legacies and aspirations of the brave soldiers of the resistance army. In recent years, this association faced division among themselves and key leaders of Chushi Gangduk faced lots of challenges within the community. To avoid such problems, they had to affiliate to various political scenarios in exile resulting in subjugation of their authority. Does the decision of New York Regional Chushi Gangdruk reflect the fear of what happened in the past or did they fail to take a firm stand. If Chushi Gangdruk becomes an organization that bans the call for Tibet’s Independence, it is a gross disrespect to the sacrifices of their martyrs. Why do we Commemorate March 10? Commemoration of March 10 is not a platform to strive for Independence, let alone seeking Genuine Autonomy for Tibet. The day is not to create division among ourselves but to collectively remember the uprising in 1959 against Chinese invasion and the demands of those Tibetans who took part in it. Having received permission from the American government to hold the rally and being entitled to the right to protest, how can we divide the Tibetan community and decide who can participate in protests, and who cannot? Neither shouting slogans of “Free Tibet” on March 10th would threaten China nor will banning the slogan receive a pat on the back from Beijing either. But by censoring “Free Tibet” slogans, it is highly possible that the world will start believing China’s claim that “there has never been a problem in Tibet”. Most importantly, Middle Way Policy is a middle point between independence and complete subjugation. By removing calls for Independence, we remove the basis for Middle Way. Since the occupation of Tibet, Chinese government has implemented many repressive policies in Tibet. In the name of economic development, Tibetans have been segregated and divided across various parts and many more such policies are being planned to completely eradicate the unique identity of the Tibetans. Therefore it’s very important for our movement in the long run not to project the call for Independence as hindrance among our younger generation. The organizers of the March 10th rally in New York have time and again stressed on the importance of following His Holiness’ wishes and the Central Tibetan Administration’s policies. Is it the wish of His Holiness the Dalai Lama, and CTA’s guidelines not to allow those who call for Tibet Independence in the march? Who are they trying to blacklist, and whose purpose does it serve? Few Tibetan politicians in exile, for whom it has become a ritual to make statements maligning others, are saying it wasn’t done in the right spirit. However, those who call for Independence are not a minority, and in New York, there were many people who came out shouting “Free Tibet”. It would also be wrong to think those people who were not displaying Tibet Independence banner were against those who were calling for Independence. These days, few Tibetans pretending to represent His Holiness and CTA, undermine the Tibetan Freedom Movement by criticizing those who advocate for Tibetan independence. Thinley Kelsang, Vice President of TCNYNJ, who was involved in dismantling RTYC New York during his Presidency, has accused Students for a Free Tibet’s 2008 campaigns for its “negative impact” on the Tibetan movement. He even criticized Tibetans inside Tibet who took down Chinese flag and raised the Tibetan flag in 2008 uprising against Chinese oppression. Such accusations not only serve Chinese claims but also have negative impact on our movement. Even the Tibetan Education Minister, Ngodup Tsering who was present at the March 10th event in New York, didn’t bother to investigate the incident thoroughly and presented only one-sided information which was reported to him by the organizers in his clarification at the ongoing Tibetan Parliament session. [See video at approx. 43:00] From his seemingly cautious explanation, it appears as if CTA has endorsed such actions. It is very unfortunate if these actions, which create division in the Tibetan community, are being promoted by our own administration in Dharamsala. Such actions by key community leaders not only cause conflict and division but will also discourage people from taking part in future Tibet campaigns. As a result we have no right to criticize people for losing their passion and not taking part in the movement. Generally, in a democracy, while we go with the decision of the majority, the minority has the right to express their dissatisfaction. Where can we find a democracy where the decisions of one or two people are being followed without question? Dhardon Sharling, Member of Parliament had said in the Parliament, “If few individuals use the Middle Way Policy as a platform for their personal political agenda, the real objective and purpose of the Middle Way Policy will be lost.” If this keeps on going, a day might come when it will be hard to find a single person who truly holds the authentic demand of Genuine Autonomy. (Dhardon Sharling is a Middle-Way supporter, and Human Rights and Democracy activist). Students for a Free Tibet, which was initially started as a Tibet support organization by Tibetans and non-Tibetans together, was compelled to step down from the organizing Committee of the New York March 10th event. This organization, which has members of different nationalities along with many young Tibetans, has become a strong campaign group in Tibet Freedom movement. But I still think signing of the initial agreement on the March 10th demonstrations by leaders of SFT New York with the organizers was mistake from their side. By misusing His Holiness Dalai Lama’s name, in recent years, some people in the Tibetan community in exile have found a way to criticize and render ineffective Tibetan Youth Congress and a few individuals; I suspect their target has now shifted to Students for a Free Tibet.